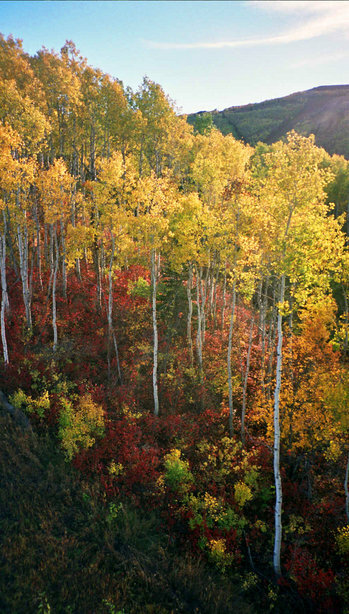 As winter approaches, I am a little bit sad that the fall isn’t longer here in Park City. When we first moved here, I remember being so excited for Utah winters (For the record, Utah winters are still better than the bitterly cold, bone chilling Indiana winters) but, they are just too long here. This year, it snowed well into June. Then we skip right over spring for a hot summer and then we were back to snow again over Labor Day weekend. Thankfully it melted and we went on with our summer as it should be. I’ve been here for nine and a half years now and fall has become my favorite season. I like the brisk air, sweater weather, the smell, and most of all the leaves. The leaves started changing colors a couple weeks ago and are ready to fall any day now. I love the fall here. The mountains look like they are on fire when the leaves change color. Not the best picture but you’ll have to take my word for it.